The College of Adaptive Arts (CAA) is a revolutionary idea. A not-for-profit organization of higher learning that focuses on offering education opportunities for adults with disabilities. Painting, music, dance - anything you would expect to find at a performing arts college you can find at CAA - but they teach it in a way that allows people with differing abilities to comprehend, achieve and grow to their full potential. Deanna Pursai and Pamela Lindsay co-founded the College of Adaptive Arts in August of 2009 as a result of a deep passion to fill the need for continuing and higher education in the community of people with disabilities. Deanna knew about this need from personal experience with her sister, Angel, who was born with Down's syndrome. Deanna and her family had to experience first-hand the reality that, while there are many programs in the United States for grade school and high school students with disabilities to learn, at 22 these students age out of most state and federal programs. For Angel, this meant that after high school she had nowhere to go to continue her education or have social activities. She became extremely depressed as her friends from high school left for college or full time jobs and she began to struggle with health issues from inactivity and overeating. Unfortunately, this situation is replayed over and over again in the lives of thousands of people like Angel who want to continue to grow and develop their skills, but need a bit of assistance. Deanna looked around and found that there is no institute of higher education that strictly focuses on offering continuing education opportunities for people with differing abilities, providing them with the chance to explore their talents and reach for their dreams. 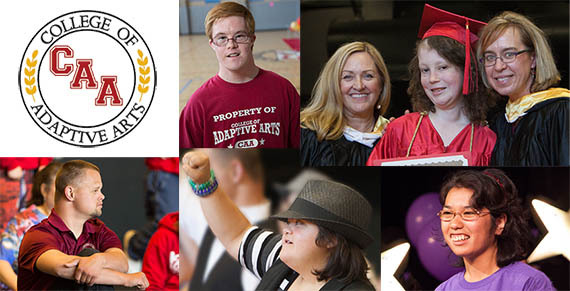 Thus College of the Adaptive Arts in San Jose, California was born. Deanna's background as a Special Education teacher and Pamela's background as a professional actress, singer, and dancer combined to help them create a curriculum perfectly suited to helping students learn and grow through the arts. They round out their curriculum with liberal arts courses, geared towards social and cognitive development, and feature classes in creative writing, public speaking, health and nutrition, video production and other technical skills that will help their students succeed in both their work lives and personal lives. One of the unique characteristics that help students at the College of Adaptive Arts to thrive is that many of the instructors have disabilities, both visible and invisible. This gives the instructors the ability to both empathize with the students and to show students the paths they need to take to grow and develop as adults. Another great aspect of the College is their graduate studies program. Their graduate students actively participate in collaborative community workshops that give them opportunities to share their skills outside the College walls and become advocates for the arts and people with disabilities. Recently the College's librarian, who happens to be legally-blind, went to a conference where she found some software called Biblioboard. Once the software is integrated into the College's website it will allow the students to upload all of their artistic creations to one portal, side-by-side with their photo and a short biography. All kinds of paintings, original songs, television shows, and other artistic works created by the College's students will now be out there for the world to see and appreciate. Plus the software enables them to invite artists with differing abilities from all over the world to upload their artistic creations! The end goal of all of Deanna and Pamela's work at the College is two-fold: first to ensure that anyone who wants to learn and grow their skills in the arts can have the opportunity; and second, to provide training that will allow any student to push the boundaries of their potential and thrive, creating successful and fulfilling lives for themselves. Join us in celebrating the work that the College of Adaptive Arts is doing. Offer your support or sign-up for one of their classes! Check them out here on WorkerAnts.com.